Are you an adult who lives in or works near the Harvard area that never had the chance to receive braces as a kid? Do you still long for the perfect smile but do not want to go through the hassle of dealing with traditional metal braces in Worcester County, MA? Not only does Walker Orthodontics offer the Invisalign for teens, but we also provide Invisalign for adults in Harvard. Dr. John Walker knows that many adults are self-conscious about how they look, but a straighter smile with the Adult Invisalign treatment is the easy solution to this problem! Invisalign is an excellent way for an apprehensive adult to straighten their teeth and achieve the perfect smile. The number of adults undergoing orthodontic treatment with Invisalign is growing every day. Adults have become more interested in cosmetic friendly oral care for professional and personal reasons. Invisalign for adults near Harvard are made of a smooth, BPA-Free, clear plastic that are worn over teeth, with the intent to subtly move them. In fact, you’ll be surprised to find out how many people won’t even notice you’re going through treatment. Oral Hygiene: The plastic is removable, allowing the patient to clean their teeth easier than with traditional braces. The aligners must be removed before drinking and eating, which causes less food to get stuck between teeth. What braces? The aligners fit against teeth and are barely visible. They can also be taken out for special occasions, however they are unnoticeable so you probably won’t need to anyway! Maintaining your current lifestyle: Without the use of metal wires there are no diet modifications necessary while wearing Invisalign. Comfort: The material used to create the aligners as well as the technology used to create the tray for the patients’ teeth allow for a more comfortable fit. 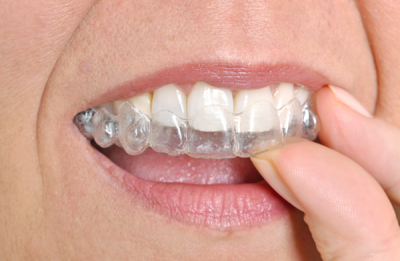 Protection: If worn while sleeping, the thin material can protect your teeth at night from grinding and clenching. Convenience: Your orthodontist will give you the aligners in sets which equates to less trips to the orthodontist. The aligners are also less painful and time consuming than traditional metal braces, most adults finish treatment in less than one year. Invisalign for adults near Harvard are made with the use of X-Rays and teeth impressions to create a 3D projection of how teeth will move during treatment. Multiple sets of aligners are created for the bottom and top rows of teeth, which get worn two weeks at a time. Walker Orthodontics will provide you with a few sets at a time, reducing orthodontist visits to every four to six weeks. Walker Orthodontics wants all of our patients to have a great smile, so if you or someone you know is interested in Invisalign for adults in Harvard, do not hesitate and contact Walker Orthodontics at (978) 456-8902 to schedule your first appointment.